A cortical disruption (arrow), along with a fine line of increased density, is noted. This is consistent with the appearance of sclerotic bone following a stress fracture. 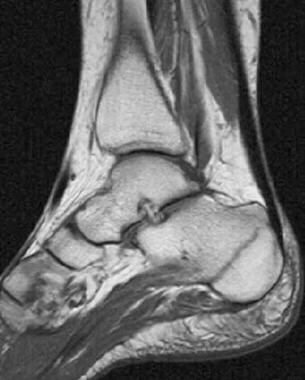 T1-weighted sagittal magnetic resonance image from the ankle. A stress fracture is noted as a linear area of low signal intensity in the calcaneus. Courtesy of Drs. Mike Handlon, Jennifer Keilp, and Molly Hester. Insufficiency fracture results when normal stress is applied to abnormal bone (such as bone with osteoporosis or Paget disease). 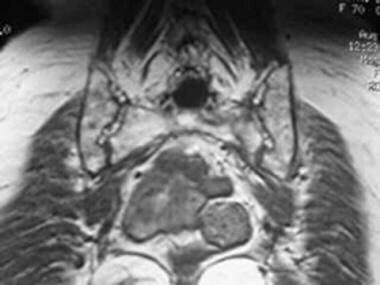 In the example of a sacral fracture (see the images below), MRI can obtain a screening of the pelvis with different sequences (coronal and axial STIR and T1 SE). An area of hyposignal is noted in the T1 sequence at the left sacrum, at the site of an acute stress fracture. 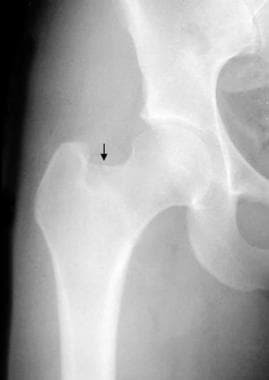 The acute stress fracture in the left sacrum appears as a linear area of hypersignal with adjacent edema. In addition, MRI is sensitive enough to detect further malignant entities causing a marrow replacement, which would make the bone prone to insufficiency fracture. Another approach can be 3-phase skeletal scintigraphy with technetium-99m (99mTc) methylene diphosphonate (MDP). In an adult, typically about 25 mCi of 99mTc MDP is injected intravenously, with the patient positioned under the gamma camera. The dose for pediatric patients is adjusted accordingly. It is important to image the contralateral normal side as well. The first phase of the study is the dynamic phase, and rapid-sequence dynamic images are obtained for approximately 1 minute. The second phase is the blood pool phase. Static planar images are obtained immediately after the dynamic images. The third-phase images consist of static planar images obtained 2-3 hours later. Compared with MRI, the advantage of scintigraphy is that the entire skeleton can be screened. Plain radiographs often are negative in the early stages of the evolution of stress fractures. MRI is very sensitive in the immediate documentation of the bony structures' stress reactions. It is well documented that MRI is able to show even minor stress changes (for example, after a marathon) at a much earlier stage than that of the actual stress fracture. Indeed, it seems sometimes to be an arbitrary cutoff between a severe bone contusion, which will contain multiple microfractures, and the actual stress fracture, which requires a linear component. Scintigraphic changes can precede plain film changes by up to a few weeks because the increased osteoblastic activity associated with a stress fracture is more easily detected by scintigraphy. On plain film radiography, stress fractures usually appear as sclerosed areas and often are oriented linearly. A focal periosteal reaction or a cortical break also may be present. A history of repetitive stress may not always be obtained. Occasionally, a stress fracture may have the appearance of aggressive periostitis without a linear sclerosis. A biopsy of these lesions may at times result in unwarranted therapy if the histopathology is confused with malignancy. This approach is still appropriate considering the fact of a potential differential diagnosis, which could include any of a variety of other underlying bone diseases that could result in stress fracture. These include a bone cyst, osteoid osteoma, or malignant entities, such as osteosarcoma. The delay in the appearance of findings can result in false negatives and can hold up therapy until the diagnosis is made by scintigraphy. False-positive results are less common, but as previously mentioned, the findings may at times mimic malignancy. Plain films still can be used, as an unexpected finding can be discovered to explain the patient's problems. Thus, in the appropriate clinical setting, CT scanning can be skipped, and either MRI or a bone scan can be performed. Repeat CT scanning is not an attractive alternative, although it can result in the correct diagnosis because of the interval development of osteonecrosis. This is particularly helpful in the case of small joints of the hands and feet, in which the relatively poor spatial resolution of the radionuclide bone scan can be a disadvantage. MRI also has the advantage of distinguishing between arthritis, osteomyelitis, and osteonecrosis, all of which potentially can have the same appearance on a bone scan. Fat suppression sequences are very sensitive for edema and can help to confirm subtle findings on T1 and T2 images. An image from a STIR is demonstrated in the image below, in which a bone bruise and surrounding soft-tissue edema show high signal areas. Short T1 inversion recovery sequence coronal images reveal a well-circumscribed area of increased signal intensity in the lateral aspect of the first metatarsal. This is consistent with a bone bruise. Also seen is a small amount of surrounding high signal intensity, which is consistent with soft-tissue edema. Courtesy of Drs. Mike Handlon, Jennifer Keilp, and Molly Hester. Shin splints are a condition commonly associated with stress fractures. They are believed to result from periosteal reaction caused by microperiosteal tears from abnormal stress mediated by Sharpey fibers, which connect the tendons to the bones. Shin splints usually do not progress to further trauma to the bone. Repeated microperiosteal tears with the associated periosteal reaction and healing response can cause increased tracer uptake in a technetium-99m (99m Tc) methylene diphosphonate (MDP) bone scan. On T2-weighted magnetic resonance images, any form of microtrauma would result in a signal increase. Fat suppression is helpful in distinguishing the signal abnormalities from the surrounding fat marrow. In a T1-weighted series, a low signal area is demonstrated corresponding to the finding in the T2-weighted images. Confidence in the imaging findings is usually high in a patient who is clinically believed to have a stress fracture. MRI findings can be positive within 24 hours of the onset of symptoms. Radionuclide bone scans can take longer to become positive, particularly in patients with osteoporosis. Other entities, such as osteomyelitis or a neoplasm, can cause extensive bone marrow edema. In addition, the detection of stress responses in hematopoietic marrow can be more challenging. The linear low signal finding usually is helpful in identifying stress fractures. Typically, stress fractures are associated with hyperemia in the first 2 phases of the 3-phase bone scan. This is manifested by increased tracer activity at the affected site. If an image of the contralateral side is available, the hyperemia is easier to detect. While detection of hyperemia is not difficult in adults, increased tracer activity around the epiphyses of pediatric patients may be difficult to detect in the absence of contralateral images. This patient had severe pain of the left heel. Radiographs were normal. 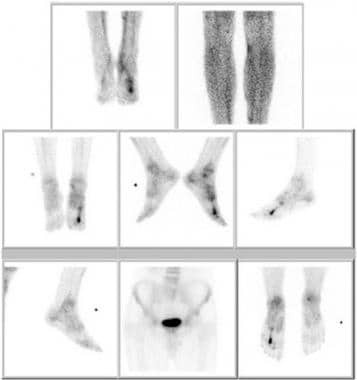 Three-phase bone scintigraphy reveals increased perfusion to the left heel (top row), increased blood pool activity in the second phase (middle row), and increased tracer uptake in the left calcaneum in the third phase (bottom row). The findings are consistent with stress fracture of the left calcaneum. The marker is on the right side. A smaller focus of tracer uptake also is seen in the left heel. This is probably because of degenerative change. The patient was asymptomatic at this site. This patient had increased her hours of running to prepare for a marathon. Her left foot was hurting. Radiographs were normal. The perfusion images are not available, but the blood pool images (top row) clearly reveal hyperemia of the left foot. The delayed static images demonstrate intense uptake of tracer in the third metatarsal. The scan findings are consistent with stress fracture of the third metatarsal on the left side. The marker is on the right side. This patient was a marathon runner who complained of pain in his left leg. Radiographs were normal. 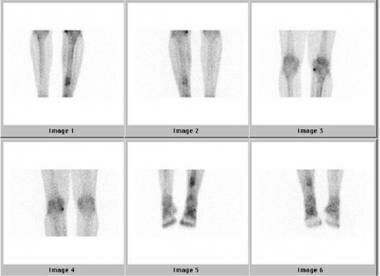 The top 2 rows are perfusion images; there is increased perfusion to the left leg. 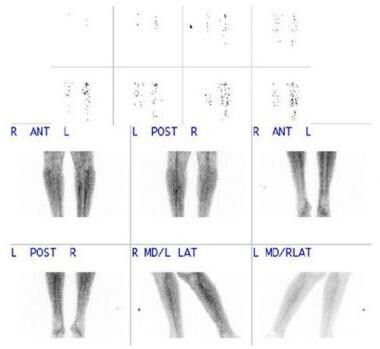 The bottom 2 rows are blood pool images, demonstrating increased blood pool activity in the left leg. Delayed images of the same patient as in the previous image. Increased tracer uptake is noted just below the midpoint of the shaft of the left tibia. The findings are consistent with a stress fracture of the left tibia. Note increased tracer activity from degenerative changes at the medial portion of the right knee. The patient was asymptomatic at this site. Bilateral fractures of the sacral ala can produce a pattern of tracer uptake that is often termed the Honda sign. The hyperemia observed in the first 2 phases is most intense during the first 2-3 weeks and then gradually diminishes. The increased tracer uptake observed in the third phase remains positive much longer. While some lesions resolve in approximately 6 months, it is not uncommon for lesions to be scintigraphically detectable even after 1 year, although the intensity and size of the lesion gradually diminish. Acute traumatic fractures can reveal somewhat similar findings on skeletal scintigraphy, but the uptake pattern in stress fractures usually demonstrates a smaller area of increased tracer activity than does the uptake pattern of fractures resulting from acute trauma. In patients with multiple stress fractures, an accurate determination of the age of the fracture may not always be possible. Particular attention must be given to epiphyses in children, as the physiologic increased uptake of tracer in the epiphyseal region can easily mask increased tracer activity caused by osteoblastic activity. In patients with severe osteoporosis, tracer uptake by the bone may be too low, and false-negative results may be produced. 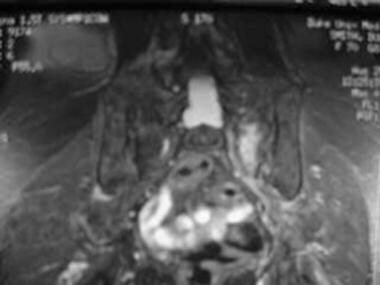 Bone neoplasms can have a tracer uptake pattern similar to that of stress fractures. It is important not to confuse the 2 of these. While the history alone is sufficient in most cases to resolve the issue, correlation of the findings with that of plain film radiography should be adequate in almost all situations. In nuclear bone scans, symmetrical positioning of the limbs is crucial. A limb that is nearer to the gamma camera head as compared with the contralateral side will show an apparent increase of tracer uptake, and this can cause diagnostic confusion. Angiography is not usually performed for the diagnosis of stress fractures but may demonstrate the associated hyperemia. Wright AA, Hegedus EJ, Lenchik L, Kuhn KJ, Santiago L, Smoliga JM. Diagnostic Accuracy of Various Imaging Modalities for Suspected Lower Extremity Stress Fractures: A Systematic Review With Evidence-Based Recommendations for Clinical Practice. Am J Sports Med. 2015 Mar 24. [Medline]. Pommering TL, Kluchurosky L. Overuse injuries in adolescents. Adolesc Med State Art Rev. 2007 May. 18(1):95-120, ix. [Medline]. Iwasaki K, Yamamoto T, Motomura G, Karasuyama K, Sonoda K, Kubo Y, et al. Common site of subchondral insufficiency fractures of the femoral head based on three-dimensional magnetic resonance imaging. Skeletal Radiol. 2016 Jan. 45 (1):105-13. [Medline]. Pelletier-Galarneau M, Martineau P, Gaudreault M, Pham X. Review of running injuries of the foot and ankle: clinical presentation and SPECT-CT imaging patterns. Am J Nucl Med Mol Imaging. 2015. 5 (4):305-16. [Medline]. Rauscher I, Beer AJ, Schaeffeler C, Souvatzoglou M, Crönlein M, Kirchhoff C, et al. 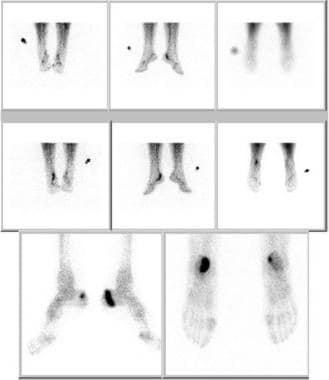 Evaluation of 18F-fluoride PET/MR and PET/CT in patients with foot pain of unclear cause. J Nucl Med. 2015 Mar. 56 (3):430-5. [Medline]. Savoca CJ. Stress fractures. A classification of the earliest radiographic signs. Radiology. 1971 Sep. 100(3):519-24. [Medline]. Greaney RB, Gerber FH, Laughlin RL, et al. Distribution and natural history of stress fractures in U.S. Marine recruits. Radiology. 1983 Feb. 146(2):339-46. [Medline]. [Full Text]. Moed BR, Ajibade DA, Israel H. Computed tomography as a predictor of hip stability status in posterior wall fractures of the acetabulum. J Orthop Trauma. 2009 Jan. 23(1):7-15. [Medline]. Cheung Y, Perrich KD, Gui J, Koval KJ, Goodwin DW. MRI of isolated distal fibular fractures with widened medial clear space on stressed radiographs: which ligaments are interrupted?. AJR Am J Roentgenol. 2009 Jan. 192(1):W7-W12. [Medline]. Gregg JM, Schneider T, Marks P. MR Imaging and Ultrasound of Metatarsalgia-The Lesser Metatarsals. Radiol Clin North Am. 2008 Nov. 46(6):1061-78. [Medline]. Lancianese SL, Kwok E, Beck CA, Lerner AL. Predicting regional variations in trabecular bone mechanical properties within the human proximal tibia using MR imaging. Bone. 2008 Dec. 43(6):1039-46. [Medline]. 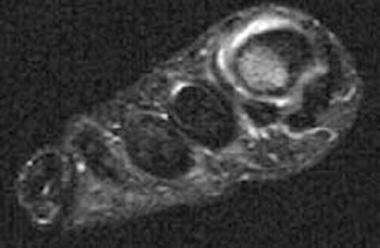 Lee JK, Yao L. Stress fractures: MR imaging. Radiology. 1988 Oct. 169(1):217-20. [Medline]. [Full Text]. Rosen PR, Micheli LJ, Treves S. Early scintographic diagnosis of bone stress and fractures in athletic adolescents. Pediatrics. 1982 Jul. 70(1):11-5. [Medline]. Zwas ST, Elkanovitch R, Frank G. Interpretation and classification of bone scintigraphic findings in stress fractures. J Nucl Med. 1987 Apr. 28(4):452-7. [Medline]. [Full Text]. Markus Holzhauer, MD, is gratefully acknowledged for contributions made to this topic.